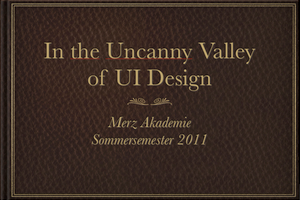 Seminar at Merz Akademie about the Uncanny Valley of User Interface Design. Projects between abstraction and realism, symbols and images. The Uncanny Valley is a hypothesis concerning the emotional response of humans to non-human entities (Wikipedia) that applies for example to humanoid robots and faces in computer graphics. One might presume that, the more realistic a human face is mimicked by a robot or CGI character and resembles human behavior and gestures, the more we might be attracted. That is not the case, for example many viewers find almost-but-not-quite-human CGI characters to be disturbing or creepy. 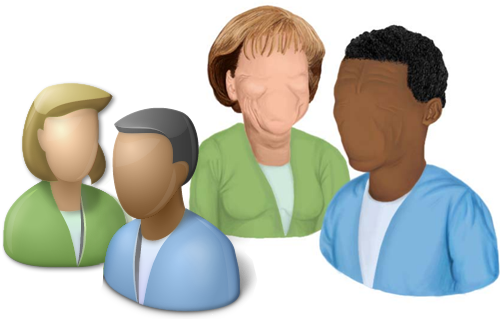 Started in 2007 by Bill Higgins and in 2010 fueled by Apple’s iOS Human Interface Guidelines that encouraged designers to create realistic surfaces and to use real-life analogies for the programs on the device, the Uncanny Valley also starting to be discussed in the fields of User Interface Design. In the seminar at Merz Akademie in Stuttgart we found ourselves between the once reduced styles of Susan Kare and the currently opulent Apple icons, between the by-nature minimalistic Kindle Interface and the shiny iBookstore and since WWDC2011 took place on Tuesday, the whole seminar was overshadowed by iCloud and the imagery that came with Steve Jobs keynote. Constanze Link and Charlotte Hofstetter got tired by the many gloss effects they encountered on their UIs while researching on the seminar’s subject. Eventually the artists made two sculptures from Windows and Apple logos and dashed them with the one and only real gloss effect. Yay! Now that most icons are pseudo 3D, Denis Hoffmann decided to catch a glimpse at the other side of those icons. How—for example current browser icons—would look from the other side. 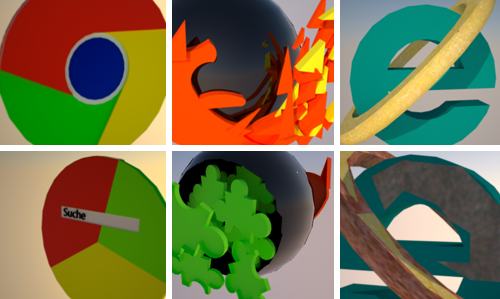 The backside of Chrome unmasked the software to be no browser but a huge Google search field. Firefox is open, of course. And not surprisingly, Denis discovered IE to get rusty on the other side. Lisa Hofmann, Sascha Mickeleit, Shirin Sparr and Kristina Spurgat made a precise real-life model of the Photo Booth icon from iOS. They underwent deep research to find the right equivalents to Photoshop textures and gradients, eventually found an old stool on Kristina attic and surprisingly the cheapest red blanket IKEA hat on stock was remarkably similar to the red curtain of Apple’s Photo Booth. Built on wheels, they took their Photo Booth to the city and tried to squeeze passers-by inside, noticing that the icon’s proportions do not make the model a well-suited apparatus to make images. The stool of the icon and its perfectly rebuilt model was just too tall. Laura Lasinger had a look at the iWeb icon and rebuilt it with gigantic pins to fit the proportions. Even though, Lion is not yet published, she presumed Apple to tell another John Appleseed story on the papers of the Versions card box. After watching Steve Job’s keynote on WWDC2011, Susanne Müller was confused by Jobs’ proposal to upload all her stuff to the cloud. She already had all her important stuff with her. Nevertheless Susanne also wanted to keep up with the times and made “myCloud”, the iCloud alternative in the shape of a handbag. This bag even has a small pocket for her iPhone. All your stuff and data stays in reach and accessible—no need to synchronize. Thomas Noschka is a real master with graphic tablets and strives for realism in his illustrations and opulence in design. He was shocked after he saw the demo of Windows 8 and the minimalistic approach that is used for its typography and icons and tiled layout. Comparing that to previous Windows versions (Bob, XP, Vista, 7), this new minimalism just did not fit. So he proposed a even more realistic (and still not photorealistic) version of icons to bring Microsoft again on the right track. Uncanny! Thanks to all the participating students for their great works. A documentation of the seminar can be found on our Uncanny Tumblr Blog, more images on my Flickr.